February is Black History Month and to celebrate, I have joined up with 27 of the best black food bloggers from around the globe for a Virtual Potluck! From African to Creole, Caribbean to Southern there is something for everybody; with each blogger contributing their very own recipes in a number of categories (Meat Entree, Seafood Entree, Vegetarian Entree, Beverage and Dessert) to share with you each day of Black History Month. Check out and try some of the other amazing recipes from our participating bloggers listed at the end of this post! 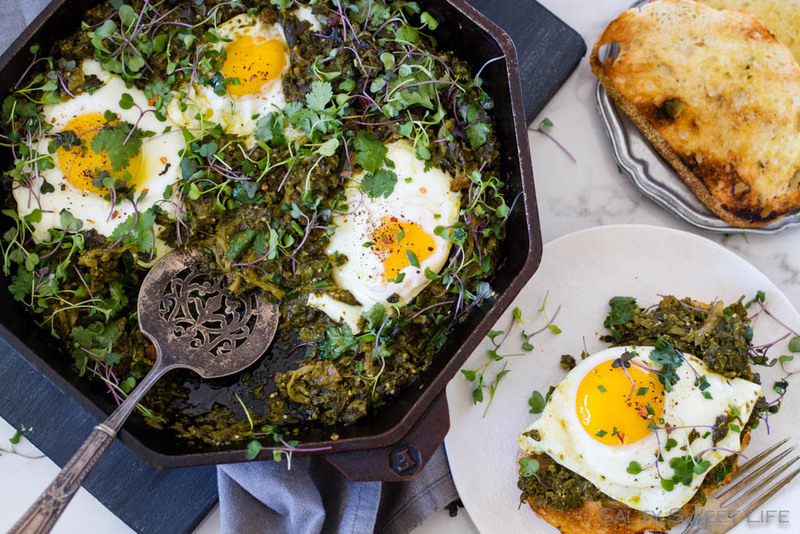 For my contribution to this special Black History Month Virtual Potluck, I have combined the irresistible forces of brunch and southern cooking to create a Southern Greens Shakshuka that is literally brimming with All The Greens. Shakshuka is a Tunisian (North Africa) dish that is especially popular in Middle Eastern cultures. It is traditionally made with stewed tomatoes and spices with eggs cooked or baked on top. I love the dish in its original form, but wanted to experiment with making it a little different, with southern flair. If you are familiar with soul food cooking, collards and mustard greens will likely already be in your cooking repertoire. When I was growing up in the Southern United States, we braised our greens for a long time, usually with a smoky pork hock, and served them up with vinegar and hot pepper sauce. As I’ve gotten older and because I’ve lived in the Southwestern United States for most of my life, my consumption and preparation of greens has evolved. I am just as apt to use a collard leaf as a wrap (please don’t come for me Black Twitter) or add sautéed mustard greens to a bowl of Asian noodles as I am to make a pot of smoky, stewed greens. Personally, I think this type of cross-cultural cooking is what makes this country so great. We are informed by our upbringing, and then we expand our abilities as we experience the rich and diverse cultures of this country and the world. For me, combining southern greens with a middle eastern dish is my own tiny contribution to cultural détente. And let’s face it…we all need to eat more greens. 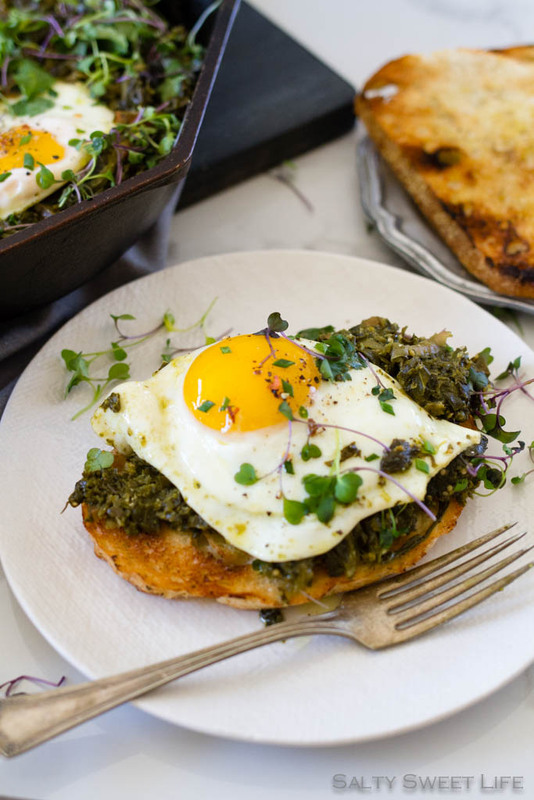 This is a perfect clean-out-the-fridge meal if your refrigerator is stuffed with lots of leafy greens that you meant to make, but didn’t get around to it and now you’re afraid they are going to go bad. Tart, tangy tomatillos form the base of the dish, but if it were summer, I would certainly use green tomatoes. Throw in some jalapeños for heat, then follow with every leafy green you can find. Here, I used a combination of collard greens and mustard greens along with kale and swiss chard. It’s healthy and it’s filling. You will eat this dish and feel positively virtuous. This dish takes a bit of preparation work at the front end, but it comes together very easily with the use of a food processor. Cooking the eggs properly can be a bit of a challenge, and in truth, I overcook them more often than I’d like to admit. You have to keep a close watch on them, or else they will go from being raw and runny to completely hard-cooked yolks in what seems like a millisecond. If this is your preference, then this is perfectly fine, but in my opinion, the only good yolk is a runny yolk! So, keep a close watch on that pan and keep the heat low. Fill a large mixing bowl with water and ice cubes to make an ice bath. Place the tomatillos and the whole jalapeño peppers on a foil-lined sheet pan and roast under the broiler or in a 450 degree oven until the tomatillos are browned all over and have begun to release their juices and the jalapeños are evenly charred. Remove from the oven and allow to cool. After they are cool, peel the skins from the jalapeño peppers. Discard the stems, slice in half and remove and discard the seeds. 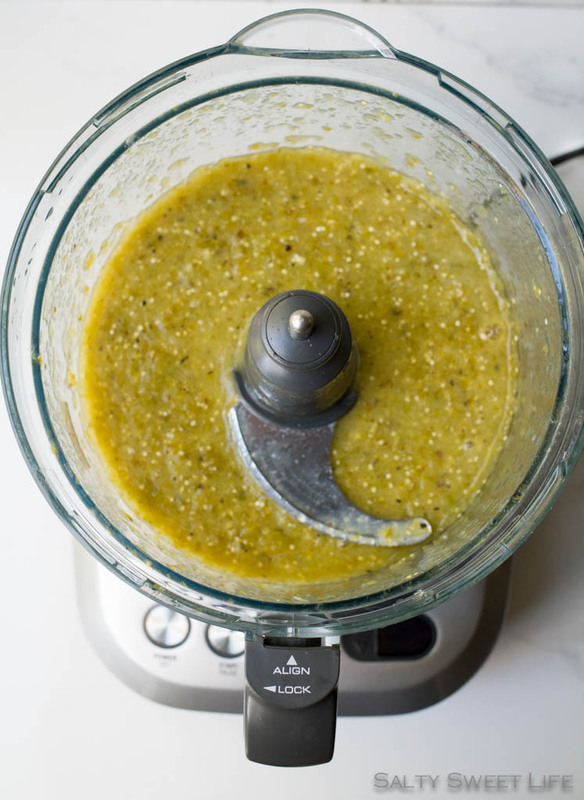 Puree the tomatillos and jalapeños in a food processor until smooth. Bring a large pot of water to a boil over high heat. Add a generous pinch of salt, then in batches, blanch the greens for one minute, or until the color intensifies. Remove the greens from the boiling water with tongs and immediately plunge into the ice water bath to stop the cooking. Squeeze the excess water from the blanched greens and set aside. Heat two tablespoons of olive oil in a large heavy bottomed skillet. Sauté the onion in the olive oil over medium-high heat until softened, about 5 minutes. Add the reserved, chopped chard stems and cook for 3-5 minutes. Pour in the tomatillo mixture and simmer while you prepare the greens. Rinse the base of the food processor. 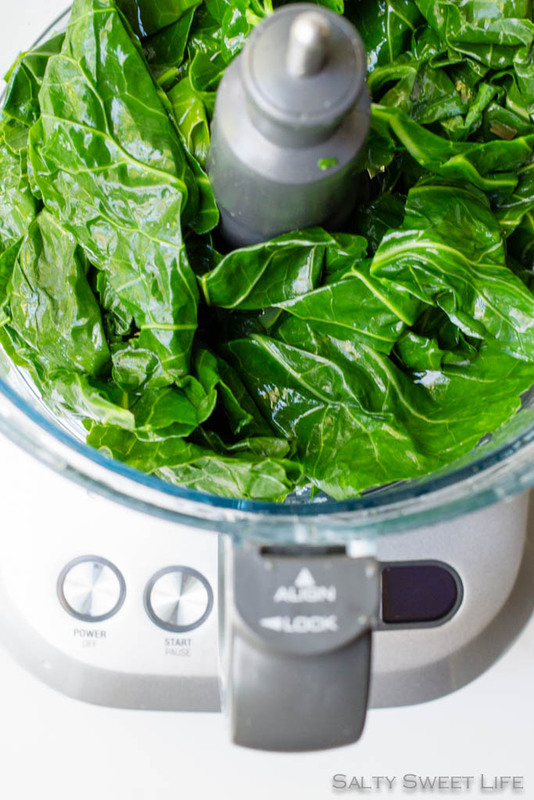 Working in batches, use the food processor fitted with a chopping blade to roughly chop the collards, mustard greens and kale. Add the chopped greens to the tomatillo mixture and stir in the honey. Lower the temperature and simmer over medium heat. Place the chard leaves, garlic cloves, 1/4 cup olive oil, cumin, salt, red pepper flakes, ice cubes in the base of the food processor fitted with the chopping blade. Pulse a few times to bring the ingredients together, then puree until very smooth. Add the puree to the greens and tomatillos and simmer for 5 minutes more. Use a spoon to make a six depressions in the mixture. Crack an egg into each depression, place the lid on the pan and simmer until the egg whites are set and the yolks are runny. Alternatively, you can cook the eggs by placing the pan under the broiler or in a 375 degree oven. 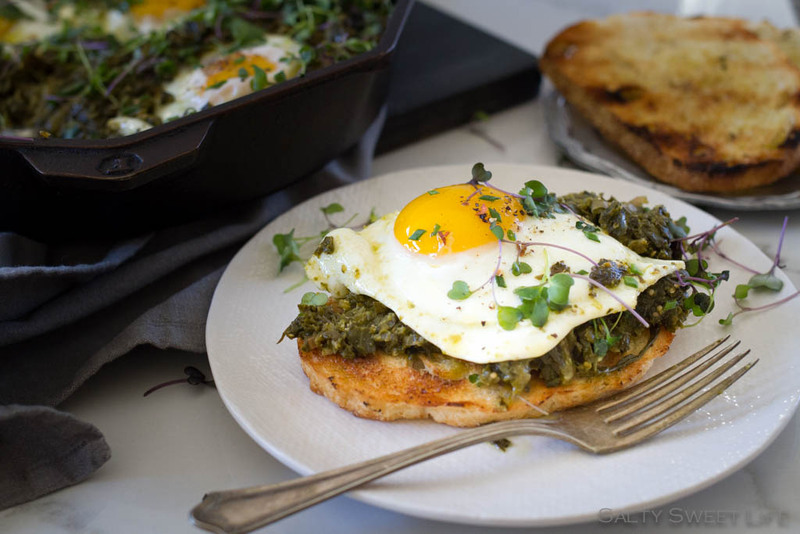 Sprinkle the eggs with flaky salt, pepper and garnish with more cilantro, chopped fresh herbs or micro greens. What a great post! Brunch is my very favorite meal too and I would love this dish. I have to admit that I didn’t grow up with greens unless you count spinach from the can drowned in vinegar but have “evolved” as well. I’ll be checking out these other recipes as well! Yeesh! Spinach in a can gives me the shivers, but I remember it! Thanks for checking out the other recipes–they are amazing! 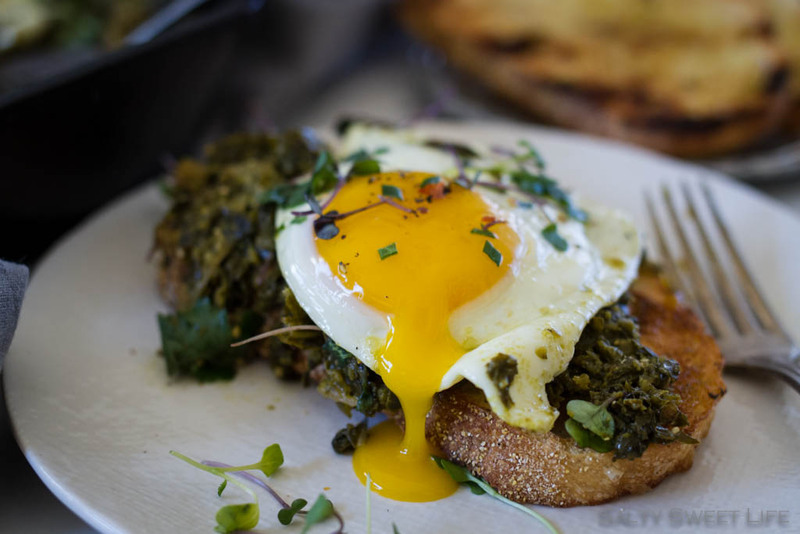 That last photo with the egg yolk dripping just made my stomach growl. What a cool idea for a virtual potluck–I’m definitely checking out the other recipes listed! Thanks Elizabeth! Aren’t runny eggs just the best?? Yes, please check out the other recipes–they are fabulous! I can say with %99.9 certainty that brunch is my favorite meal. This would be great on top of roasted potatoes as well, looks amazing. Thank you Cathleen!! Runny yolks are the BEST!